Order ‘Zig-Zagging: Loving Madly, Losing Badly… How Ziggy Saved My Life’ by Tom Wilson Jr., available from Amazon.com by clicking on the book cover above! When I was a teenager—back during the Ford Administration, if you must know—a time when Peanuts was the best thing going in daily comic strips and years before The Far Side shook up the quiet world of single-panel strips, there was Ziggy. The roly-poly, philosophical mensch was widely quoted, appeared on a zillion greeting cards, had his wisdom collected in books, and came to stand for a certain type of post-Woodstock, pop philosophy. ‘Ziggy’ cartoonist Tom Wilson, Jr.
To be honest, I lost track of my old friend Ziggy over the years; my local paper, the St. Petersburg Times, doesn’t carry the strip now and I can’t remember a time it did in the nearly 30 years I’ve been a reader. So I was honestly surprised to learn that for almost that long, the strip has been produced by Tom Wilson, Jr., son of Ziggy’s creator. And I was saddened to learn of the heartbreaking trip Wilson has been on for the last two decades. The story begins first with his dad’s illness in the early ‘90s, forcing Tom Jr. to step in on the strip, then picking up steam with his beautiful wife Susan’s diagnosis of breast cancer and followed by seven years of ultimately futile treatment. 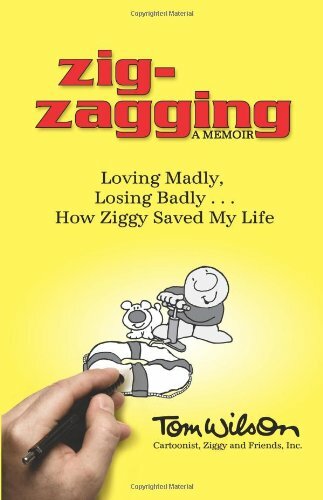 Wilson tells his story in a new book, Zig-Zagging: Loving Madly, Losing Badly… How Ziggy Saved My Life.